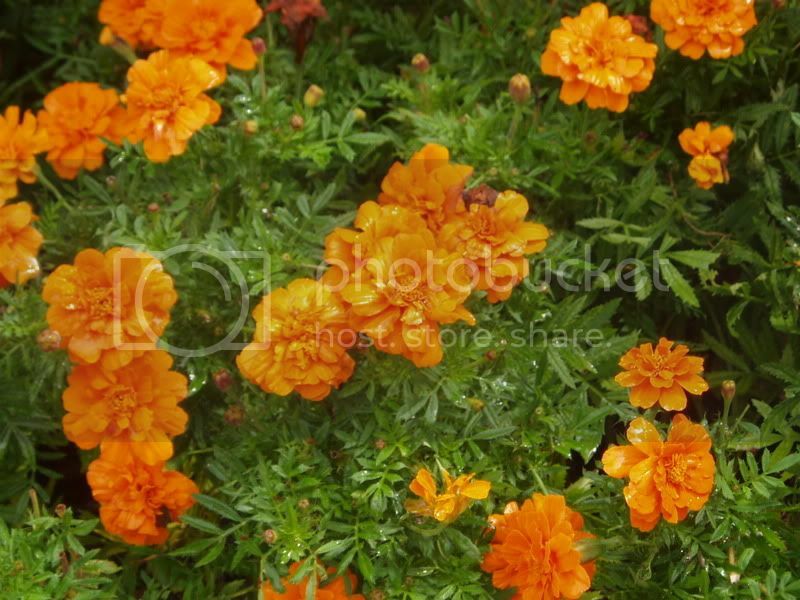 FluffyKnitterDeb: Everything's coming up orange! I never mentioned my little "accident". The day before Thanksgiving I had ventured out for the second time since the hurricane (a month prior) because I STILL have no stable front door. Walking back thru my parking lot I tripped over some hurricane debris that I didn't see because the lights in the parking lot that were damaged have not been replaced (yes, it was one of the dreaded hunks of roof that were still not removed in over a month jutting out onto the sidewalk!) When I fell I cut both my hands and really slammed my knees into the concrete. Both knees were bruised but my left knee was badly damaged. It swelled to the size of a small watermelon and I was black and blue from mid-calf to mid-thigh. I went to the doctor the Friday after Thanksgiving and have lots of soft tissue damage but nothing was broken. My knee is still very swollen and completely numb but the only treatment is keeping it elevated, anti-inflammatory meds and a warm heating pad until all the blood that seeped into the joint and tissue is reabsorbed. So even if I had a front door that locked, I wouldn't be going very far....Lovely, hmmm? Is 2005 done yet???? 2006 HAS to be better! There is good news on the horizon tho....I have an appointment for a NEW DOOR on Sunday! Now let's hope the dude shows up! On the knitting front, the bad news is the Jaywalkers are no more and the real expensive Opal is in the trash! I did ok with the pattern for the leg portion but even tho I was still getting gauge, the foot portion came out way too big. 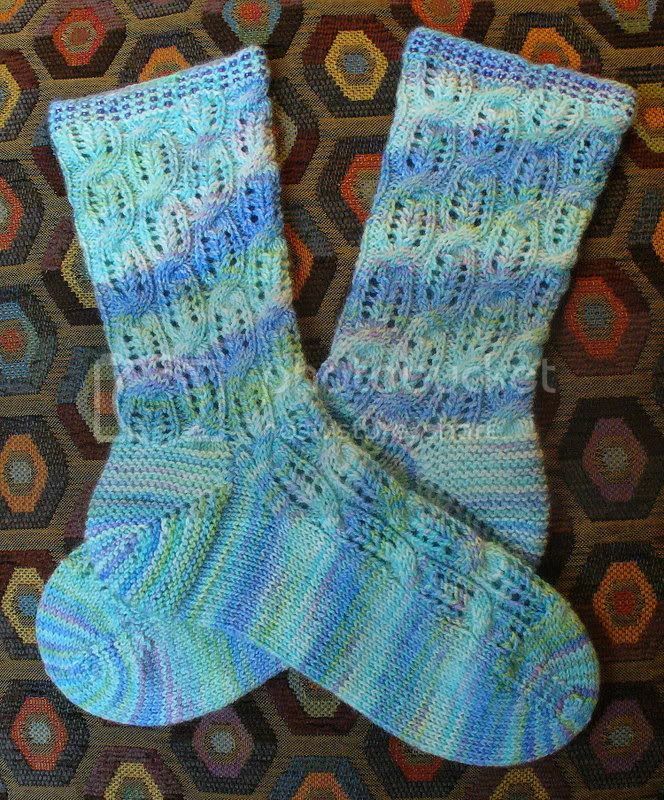 After ripping and re-knitting a good portion of the sock three times I decided the Jaywalker pattern, being designed as close fitting with negative ease, was not the best choice as a gift for someone who's feet were not accessible to me for ongoing fittings. In addition, the Opal did not hold up to frogging very well and altho it hurt my heart to toss the skein that was so dear and spendy, I couldn't live with the now fuzzy, worn appearance of the yarn! Sometimes a knitter's just gotta cut her losses so Jaywalker and $500 Opal, R.I.P! 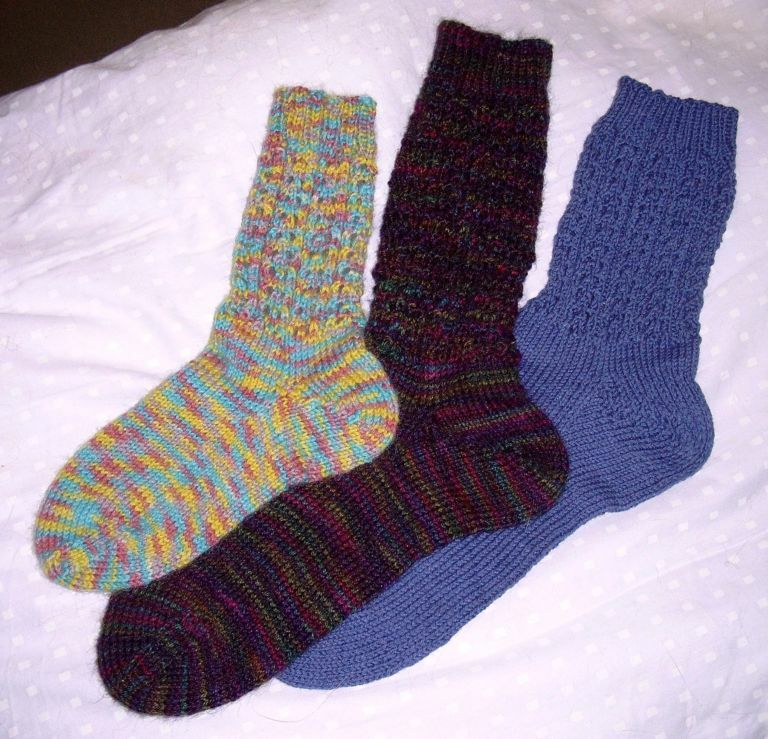 Seems all I can knit these days is socks. Perhaps I need the relatively quick sense of accomplishment or it's all my present short attention span can handle. 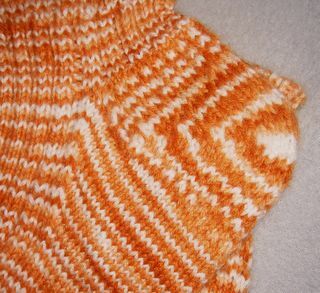 Here's the sock that took the place of the Jaywalkers.....It's the "Child's First Sock" from Knitting Vintage Socks by Nancy Bush made in Louet Gems Quartz....a light sportweight, ultra soft merino in a orange/terra cotta marl. I adore this yarn and the pattern is a very fun knit. For any sock knitters, the Knitting Vintage Socks book is a must have! Full of lovely patterns for men and women with lots of history and various interchangeable toe and heel treatments. 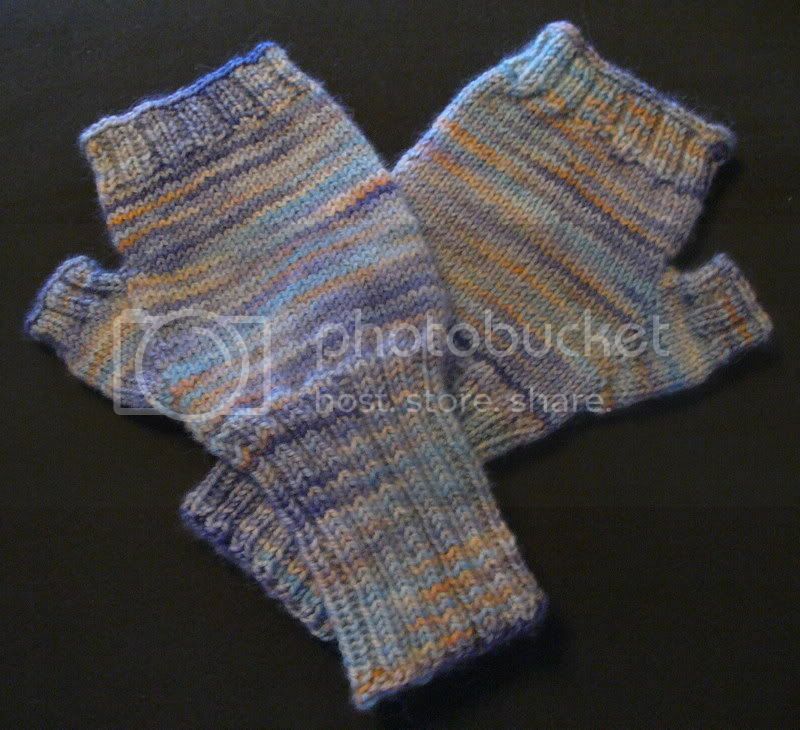 The pair is finished but I'll allow the recipient to show off the completed pair on her blog if she wishes. I just hope they fit and she likes them! I've been wanting to design the perfect pair of footies for my extra fluffy feet and I thought, what better yarn to use than the extra special, dyed just for me, Pumpkin Yarn? A bit of math and a bit of experimentation and these fit PERFECTLY!! And I love, love, love how they came out! They are sooooo soft and I love how the color goes from apricot to almost rust, just like the P-Man!! 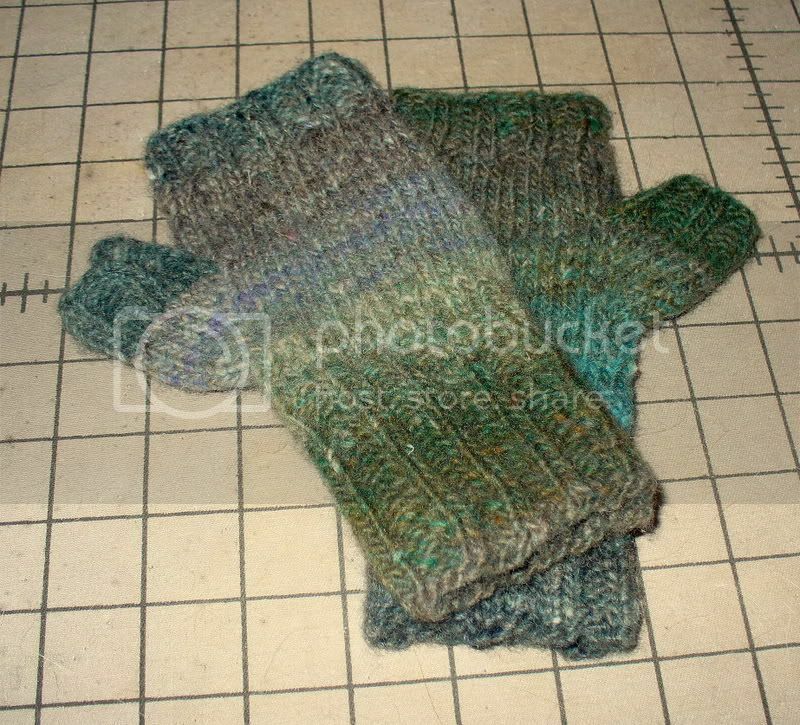 Pattern: My own.....top down, tubular 1x1 rib cast-on for cuff, 2x2 rib for leg and instep. 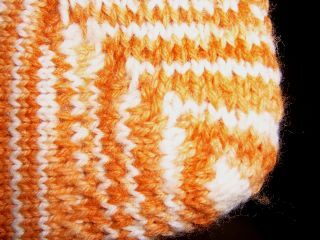 After dividing the stitches for the heel, I worked eight rows even before beginning the short row/yo decreases forming a "mini-flap". I used an Eye of Partridge slip stitch pattern starting with the work even rows and throughout the rest of the heel construction for extra cushion and strength. 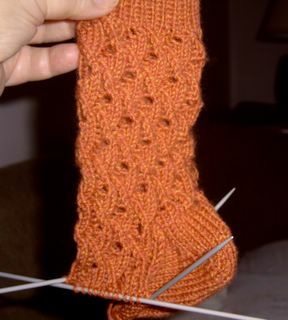 I worked the heel as I normally would for a yo short row heel but when I had completed the heel I picked up nine stitches on each side of the "mini-flap" for a mini-gusset. Once I picked up the gusset sitiches and joined them with the instep, I decreased one gusset stitch (two stitches per row) every other row until the stitch count was back to the original number. I'm really proud of the look of this heel and the fit is superb!! I think I've finally found my "formula" and can expand on more sock design from here. La, thank you again for this lovely sock yarn that's inspired me to build a better mouse trap and will always make me think of you and my P-Man! Even the P-Man has a thing for orange these days.....LOOK! 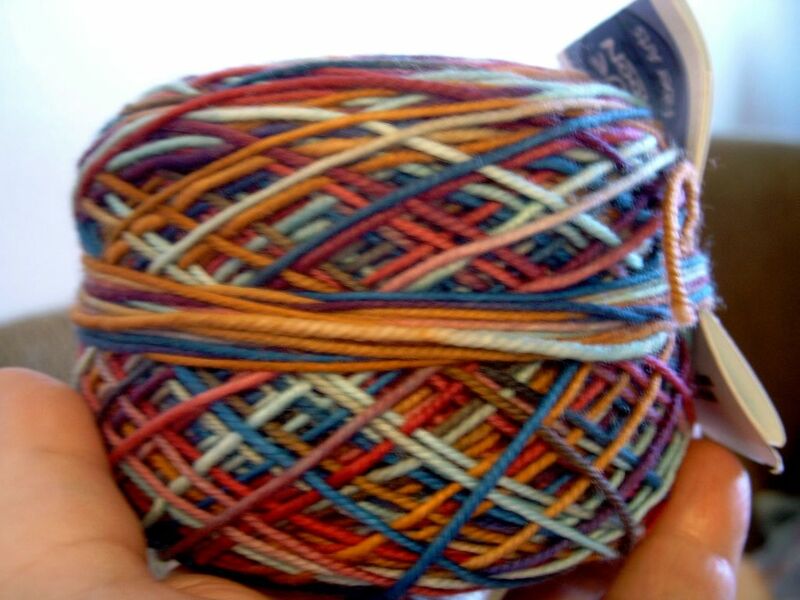 Yes, it's a beautiful skein of Socks That Rock yarn in the Mesa colorway!! My favorite grrlfriend Margene and her buddy Susan sent me a splendid care package that included this amazingly beautiful yarn, some patterns, a cute quilted bag, and a few other little goodies to make me smile! Thanks Utah Grrls! 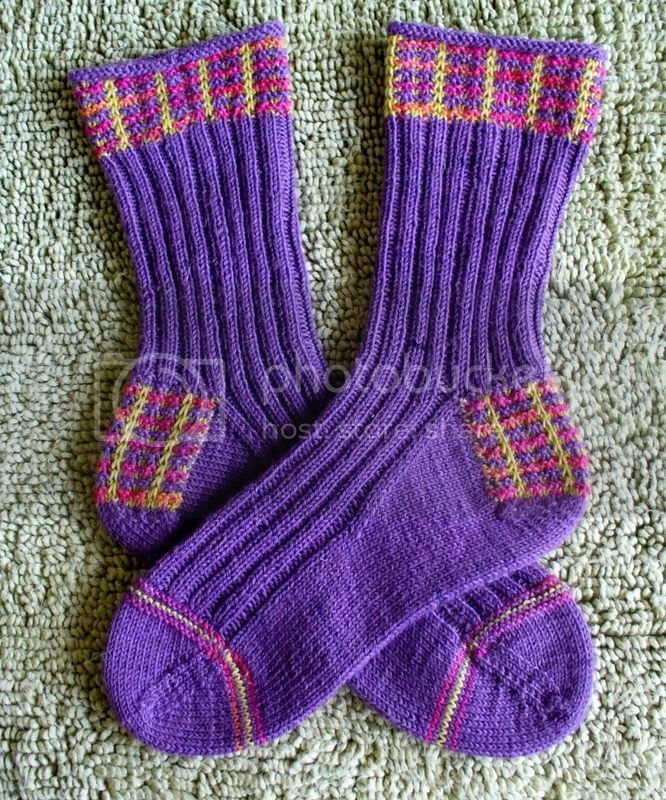 You made this knitter's day (week, month....) I'm planning another pair of footies, this time with a bit of textural interest that should do this lovely yarn proud! Thanks for all the ongoing support and kind words, now please think good "door fixing" thoughts for Sunday!! See ya soon!! YAY!!! A DOOR! That's the best news yet. The yarn La dyed is just fabulous! What a talent she has. Hope that knee heals quickly and doesn't give you any more trouble. Here's to a great 2006 for us all! 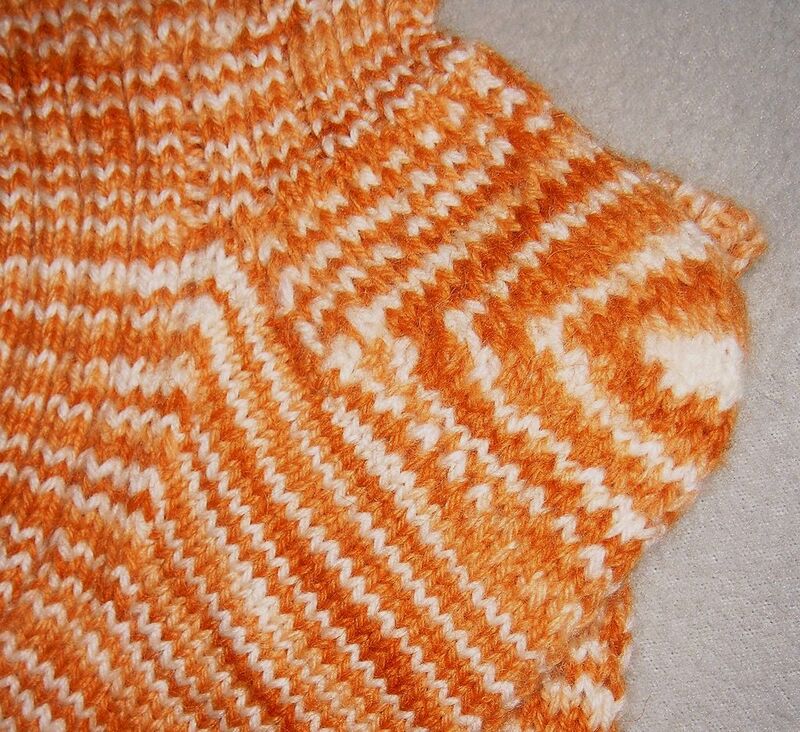 the pumpkin socks are prefect - and I love your take on the short-row heel. I've onlt done them once, and I too thought they were too shallow, but was not clever enough to modify to fit like you. Hope your knee feel better soon, and I will echo Margene's YAY!! A DOOR! statement. Thanks again for the SR heel tutorial! And I like your socks. 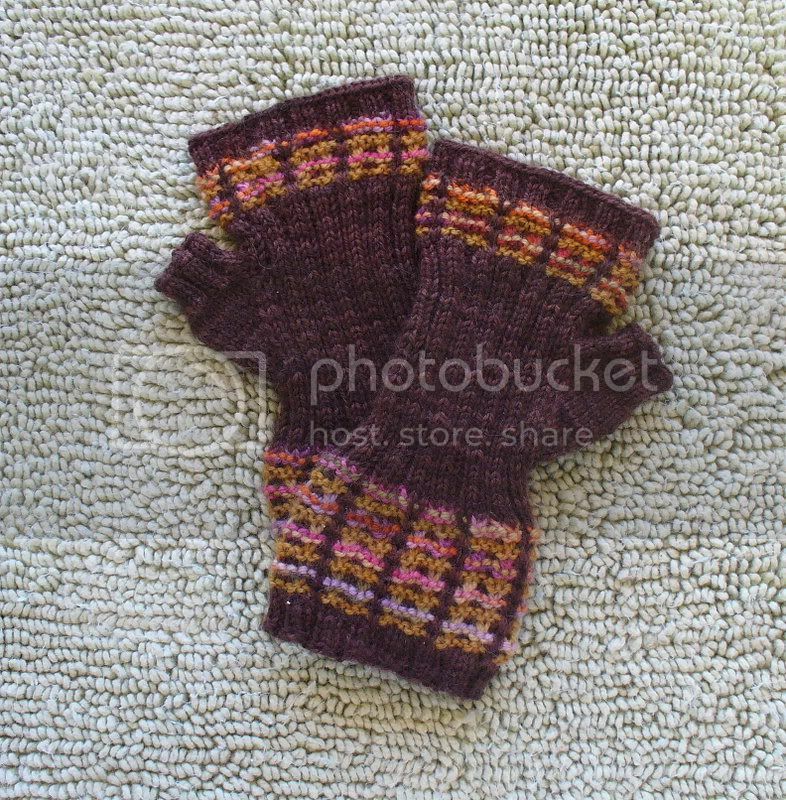 I'm also making a pair from the Child's first sock pattern. I seem to be having a bit of SSS though. I've got to cast on for the second one soon! Good luck on your door and I'm so sorry about your knee. You have to take special care of injured knees and backs (I've injured both in the past). Sending all sorts of good wishes your way! 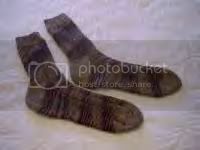 Love your socks - such nice friends you have to send you that wonderful yarn. I'm just learning to do socks and your post has certainly inspired me! Thanks. I am so in love with those pumpkin socks!! I'm sorry you're knee is still hurting. I was hoping that it would be feeling a little better since the last time we talked. Thinking good door thoughts, and then some! So sorry to hear about your fall. But you've got some good looking socks and yarn there. 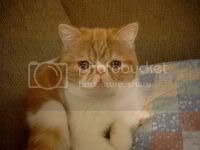 And the picture of the cat is adorable. Fingers and toes crossed for door success on Sunday! I love the socks that you've made, they look beautiful. Thinking very positive door thoughts for you!! the socks are magnificent! very interesting interpretation of the heel. I haven't felt sr heel cups to be too shallow, but I do dislike them when they pull across the top of the foot. I'll have to try that technique, because I don't like a big old gusset on the sides either. Picky picky picky, I know. Please take care of your knee. Even though you need to keep it elevated, make sure to flex your foot and wiggle the toes, that will help stimulate circulation, which will help move the fluids around faster. Also, unless the dr forbid it or it's really too painful, you might try flexing the knee without weight on it, again to move the fluids around and to help some with mobility. Have a good weekend, I'm glad to hear from you again and see your delightful handiwork. Too bad about the opal, i bet it would hhve made some decent cat toys though. Deb. Been having a really bad time of it this week, and then I read today's post and your kindness and friendship brought tears to my eyes. Thank you. Glad to hear that you're finally able to move on getting your home more secure, and even happier to hear that your knee is on the mend. P.S. Love the socks already! Love the socks........and the little pumpkin man on the ball of orange yarn is way too cute!!!! !Chin up, and I'll pray for the door man! 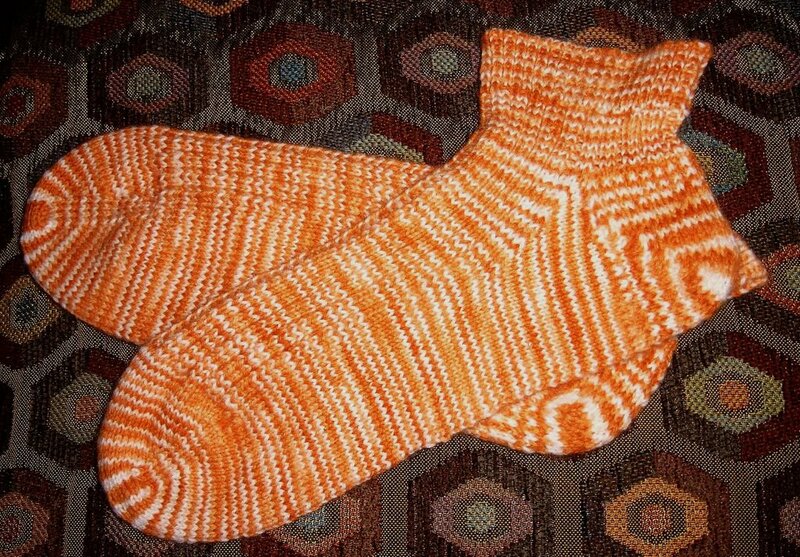 The Pumpkin yarns turned into socks are sooooo beautiful! And you know, I've been dying for a new Pumpkin pic for some time ... and the one here is just divine! Really sorry to read about your accident! Since you couldn't go out much (even before the accident), how did you get your groceries? I hope some good people are helping. I finally got to post the presents to my brother today ... but I didn't go to a post office (which was burst to the seam with people!) but a mail center in Longs Drug. I figured if I didn't do it today, I'd be late again this year! Send good karma your way pushing the door fixing dude to your place! ;) And wish your knees get well quickly! Oooooooooooh a door finally - yippee! I'm sorry to hear about your fall, and sore knee. Glad to hear nothing was broken, but knees are no fun when they hurt. I have a confession...I totally ripped off P-Man's pic hugging the yarn to put on my desktop so I could see it every day. Please say it was okay for me to do that...pretty please? Could you email me your snail mail addy? Here's a link to my knitting journal, though I'm slow to update! Sorry about the knee but really happy about the door! Whoever thought a door would make the best Christmas present? I also ripped off the p-man with his yarn pix - my screensaver is totally pictures of cats - this one and Wendy's Lucy in her St. Lucia wreath are the latest two. Cats who keep knitters are my totally fave animals (giggle). Stay well and yes, Deb, 2006 will be much better! I love the socks! I'm not too big on orange usually, but I'm totally digging both of those colors. Good stuff! Your socks and your footies look just perfect. Love them both. Sorry to hear about the accident. I hope you and your condo are both patched up (and completely healed) very soon. Praying Sunday is a complete success!!! All those socks look great! 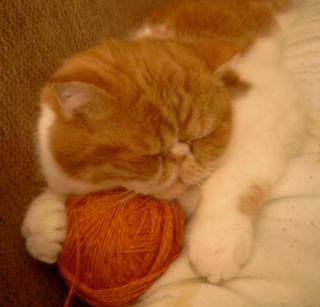 And Pumpkin with the yarn ... what a cute picture. Hope your knee is better soon and enjoy that door! Those socks are super! Good job! I hope you're feeling better soon. It's Sunday, and I hope your door is getting fixed as we "speak." Love your socks and your beautiful kitty that matches the yarn. 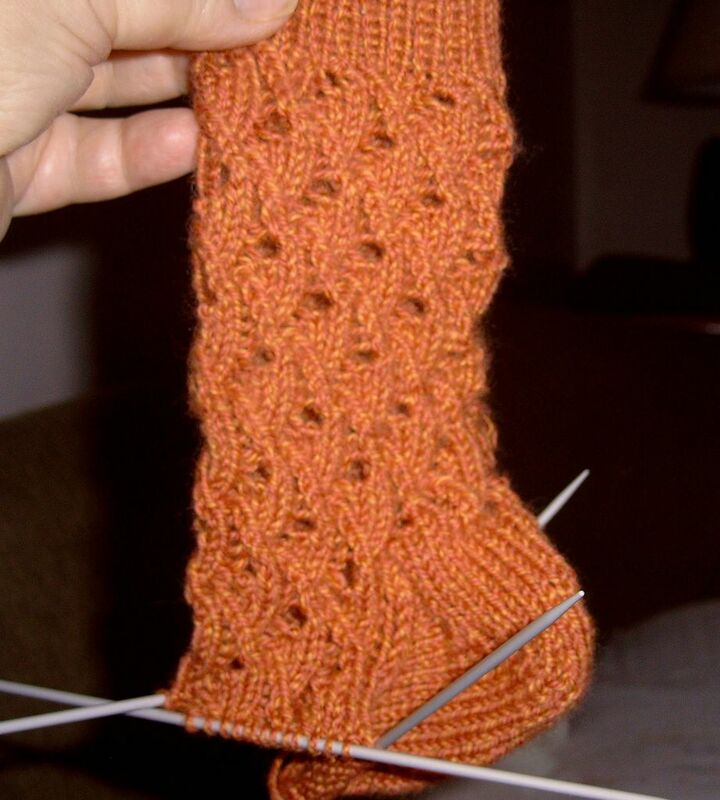 Love the pumpkin sock and thanks for sharing the tips.